Something I struggle with regularly is this idea that I’m the sum of everything I have done so far in my life, but I’m also the sum of everything I’ve failed to do as well. The challenge is to recalibrate, so that we are who we are, regardless of our actions or achievements. It’s been a while since I published an IQ. Close to four years, actually. In that time I’ve moved out of Sydney, converted a bus into a motorhome for my family of 4 to live in, travelled Australia continuously for 2 years and 3 months, built up a new business, and settled on the Mid North Coast of Australia. I’ve started to write a book about my experiences of depression, leaving a “normal” life behind, and embracing a nomadic existence. I’ve also failed to finish writing the book so far, despite a great deal of self-imposed pressure and several ridiculous high-stress “symbolic” deadlines (usually birthdays or New Year’s resolutions). In the end, I walked away from the writing process, almost universally. I haven’t written consistently, or meaningfully, for close to a year, and only in sporadic spurts before that, since I ceased publishing IQ’s daily in October 2014. This has been weighing heavily on my mind. I couldn’t answer immediately; I wasn’t really sure what brought me joy – apart from my wife and children, and surfing. I’ve been out of routine with any kind of creative practice for a very long time, and my work is completely devoted to The Root Cause these days. After some journaling, some deep introspection, and great chats with my wife, a bloke out in the surf, and another long-term mate of mine, I realised that I do love writing. I love the process of cataloguing, organising, and expressing my thoughts on the world. So now, having made peace with my desire to write, and recognising the joy it brings me on a soul level as a purely creative act, I have resolved to begin again. My writing practice has been dormant for so long that as I sit here writing I feel like I’m dusting off cobwebs and stretching creaky muscles and joints. In light of this, I have resolved to be gentle with myself. I am setting no word targets, and I am simply committing to writing a little each day to start the neurons firing again. There will no doubt be bumps, and there will probably be failures. Mistakes are more or less inevitable when we try something new, or re-start something we’ve not done for ages. Which brings me – in typical, circuitous form – to today’s quote. From today, I’m re-starting my old practice of writing and publishing IQs each day. And in this process, I’m committing to simply showing up every single morning, to have another go. 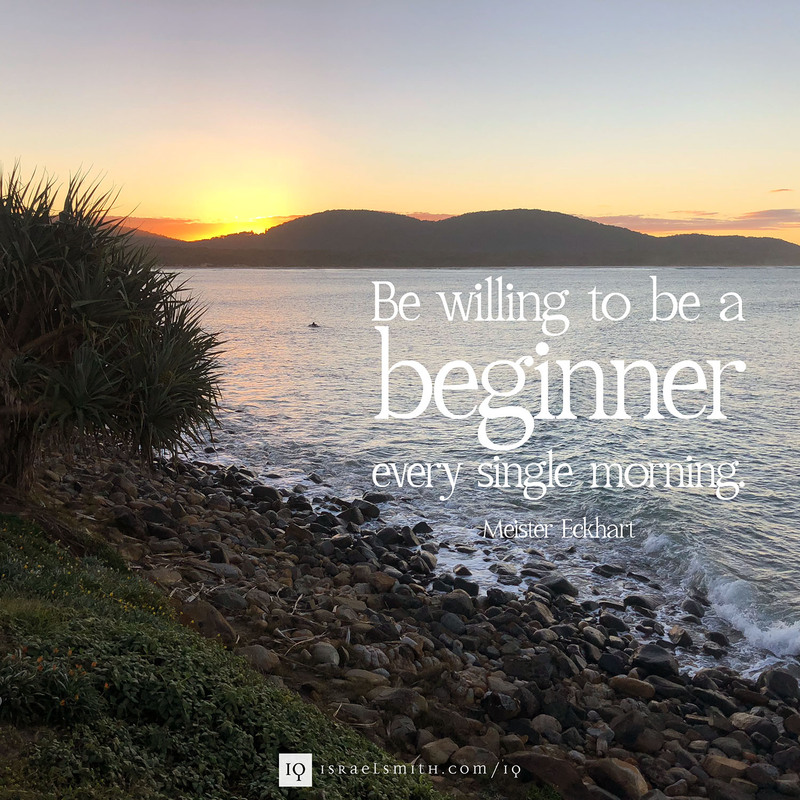 I’m absolutely willing to be a beginner every single morning, because it brings me joy. And, hopefully, it brings a little spark of light, love, or inspiration into your day, and adds a little value to the world. That’s all I can hope for.